It's finally time for Secret Recipe Club again! The club took a break during the month of December since it's such a busy time. But it's great to be back. I've been waiting for a really long time to share this awesome recipe with you! This month I was assigned a blog I was quite familiar with: The Cookin' Chemist. I've had it on my blog reader for quite some time now. It's written by Tessa, who is not only a great cook, but also a pharmacist. Neat! Tessa has some really great recipes on her blog. A few I bookmarked were her Spicy Orange Chicken with Apricot Dipping Sauce, Hearty Chicken Stew with Sweet Potatoes and Quinoa, and her Crockpot Cheddar Beer Chicken Tacos. (Anything beer and cheese-related is getting my attention lately. Come back to tomorrow to see why.) But the recipe that I couldn't wait to try the most was her Spicy Sweet Squash Bowl. It sounded amazing. I love roasted butternut squash and have been experimenting more with quinoa, so it was right up my alley. I changed it just slightly; here's my adaptation. Preheat the oven to 400°. Line a rimmed baking sheet with foil. Coat the squash with olive oil, sugar, cinnamon, 2 tsp curry powder, and salt. Roast until fork tender, about 15-20 minutes depending on how large you cut the squash cubes. Meanwhile, place quinoa in a medium saucepan with the 3 cups broth, 4 tsp curry powder, ground chipotle, and brown sugar. Bring to a boil. Cover and reduce heat to a simmer. Cook for about 15 minutes until the liquid is completely absorbed. Stir in the spinach leaves and replace lid. Let sit for a few minutes. Remove the lid and fluff with a fork. For the white bean hummus, puree the cannellini beans, ¼ vegetable broth, 1 tbsp olive oil, 1 clove garlic, and salt to taste. To serve, divide the quinoa mixture between four bowls. Top with the roasted squash and finally with a dollop of white bean hummus. Sprinkle with chopped cilantro, if desired. I'm always on the lookout for great meatless main dishes because I like to serve them at least once a week. And I get bored easily, so I'm always needing new inspiration. This did not disappoint! I absolutely love the contrast of flavors and textures in this dish. The spicy sweetness of the squash, the salty chewiness of the quinoa, and the garlicky creaminess of the white bean puree. It was amazing! It's been a whole month since I made this; I couldn't wait to share it with you! I made it on a weekend when my mom was visiting. She had never had roasted butternut squash or quinoa, and she loved it too. The changes I made were minimal. I omitted the pecans in Tessa's recipe and I doubled the quinoa because we had way more squash than quinoa. You might end up with more than you need, but I much prefer that. It makes a great lunch the next day. Yum! We just got a squash in our produce box, so I will have to try this...looks so healthy and delicious. This looks so good! I love squash and this combination sounds delicious. sounds like a great recipe. I enjoyed checking out your site, you have some wonderful recipes that I hope to try. I'm all about the squash right now and have been meaning to try cooking with quinoa more often, so this recipe sounds like a perfect fit! Love the combination of healthy ingredients and interesting flavours. Looks so good! I would have never thought of adding the white bean puree. 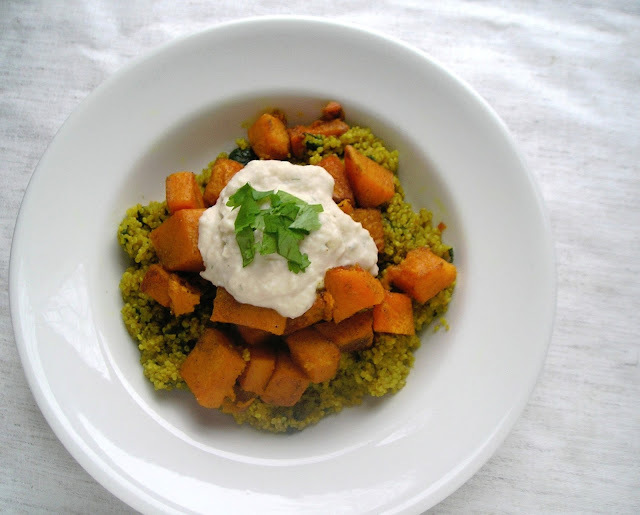 Butternut squash and curry, two of my faves together so I know that I'd love this dish. YUM! I love quinoa! This sounds like such a flavorful, healthy meal. Lovely! Oh, this looks so good! I adore quinoa and you add in curry... another favorite. Yum! Love quinoa and always looking for new ways to use it!